Years ago I used to scratch my head at Jesus’ response to the question “What is the greatest commandment?” in Mark 12:28. Why does he start with the line “Hear O Israel, the Lord is Your God, the Lord alone” before stating the command: “Love the Lord your God…”? Why state a fact before giving a command? Why not just give the command? I talked a little about this in chapter 2 of Walking in the Dust of Rabbi Jesus, when I discussed how this a quotation of Deuteronomy 6:4-5. These two lines are the beginning of the Shema (“shmah”), the daily prayer of recommitment that has been recited morning and evening for over 2000 years. Both in the Shema and here, there is a statement about God, and then a command to be loyal to him. Jewish scholar Moshe Weinfeld points out the reason why. The beginning of the Shema is actually a sermon about the first commandment. It’s a reiteration of this central decree that demands utter commitment to God from his people. Notice that the Shema is not very far away in the text, less than a chapter later in Deuteronomy. Weinfeld points out that in both cases, the two lines should be read together. The first line, the statement about God, provides the motivation for the command to follow. Because God brought you out of the land of slavery, you shall have no other gods before him. In the same way, the Shema declares that because you know God is the one true God, you should love the Lord your God with all your heart and soul and strength. Hmm…interesting. When Jesus was asked what the greatest commandment is, his answer was to quote the Shema, which itself points back to the first commandment. The greatest commandment is the very first! Moshe Weinfeld, Anchor Bible Commentary, Deuteronomy 1-11 (New York: Doubleday, 1991) 285-6. I can’t get your “subscribe to blog” button to work, so I will try checking “notify” below. I enjoyed your last book, and I hope to read your current book soon. I have a yearning to learn more about the Jewishness of Jesus, so I can know Him better, more intimately. Thank you for writing your books on this subject. 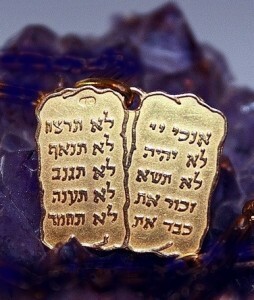 This is just one more hint that the “commandments” are much more than “regulations.” Torah reveals God and His motives. I have always struggled with rules, commandments and ordinances de-coupled from the genius, justice and love which first issued them.